High animal-protein, grain-free, boosted nutrition with bites of freeze-dried raw meat, made especially for your small breed, Instinct Raw Boost Grain-Free Recipe with Real Beef for Small Breed Dogs is a better way to feed kibble. Unlock your dog’s potential to thrive and put more of the pure, real nutrition of raw into every bowl. 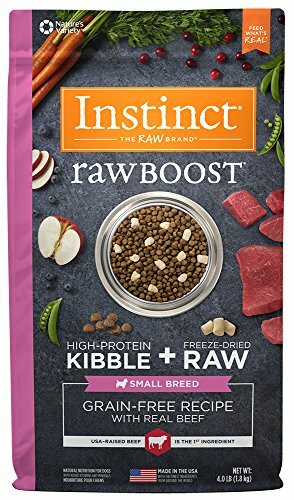 SMALL BREED GRAIN FREE DOG FOOD WITH FREEZE DRIED RAW USA RAISED BEEF: Instinct Raw Boost natural dry dog food combines high protein, grain free kibble with all natural bites of freeze dried raw beef. USA raised beef is the #1 ingredient. THE FIRST RAW BOOSTED SMALL BREED KIBBLE: Raw Boost mixes natural, high protein, grain free dog food with our freeze dried raw dog food toppers in one bag. Also includes probiotics and omegas. Complete & balanced nutrition for small dogs, puppy to senior. POWER OF RAW INGREDIENTS: Our dog food is made with the pure, real nutrition of raw. Raw is natural, made from real meat & whole food ingredients, protein packed & minimally processed. Made in the USA with the finest ingredients from around the world. OUR BEST DOG FOOD FOR SMALL DOGS BOOSTED WITH RAW: We craft dry & wet dog food from real ingredients. Compare Instinct to Blue Buffalo, Rachel Ray, Hills Science Diet, Purina One, Taste of the Wild, Merrick, Natural Balance, Wellness, Orijen, Royal Canin. If you have any questions about this product by Instinct, contact us by completing and submitting the form below. If you are looking for a specif part number, please include it with your message.